John West canned fish, distributed in Australia by Simplot, is presented as environmentally friendly in this print advertisement featuring a fisherman and a grizzly bear, a reference perhaps to the classic “Bear” television commercial produced by Leo Burnett in 2000. John West has a close affiliation with the Marine Stewardship Council and is a strong supporter of the MSC’s mission to encourage and promote responsible, sustainable fishing practices globally. As a result, all John West Red and Pink Salmon products canned in Alaska carry the MSC certification. “Nature appreciates sustainable fishing”. 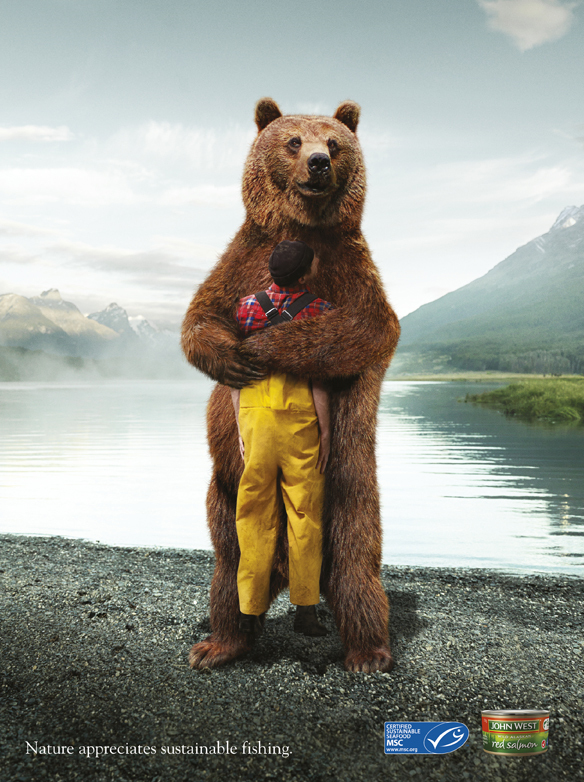 The Bear Hug ad was developed at Grey, Melbourne by executive creative director Ant Shannon, copywriter Sharon Condy, art director Josh Murrell, agency producer Sandi Gracin, account director Ben Dalla Riva, account manager Tim Clark, with photography by Andreas Smetana and Michael Corridore retouched at Cream Studios.